Marquette fans were treated to some of the best basketball of the season during their last game against Georgetown. Matt Carlino came within a quarter of an inch of winning the game for the Goldent Eagles at the end of regulation. Instead, the last minute shot was ruled a two and Marquette eventually fell in overtime for their third straight loss and fourth in five games. Golden Eagle fans have been spending a lot of money on cardiologists during that stretch, as Marquette trailed by one with less than a minute in every single game. Seton Hall enters with a three game losing streak of their own. After being ranked for a brief period, the Pirates have lost to Butler twice and the surprisingly challenging DePaul. Both teams will try to correct their trajectory on Wednesday. The Game Plan: Seton Hall looked to be the surprise of the Big East when they knocked off Villanova, the undisputed top dog in the Big East. But these past three games have reminded fans of the bottom dweller the Pirates usually are. In their two most recent games, the pirates have combined for 40-120 (.333) FG% and 5-33 (.152) 3P%. Their shooting drought has lead them to two of their worst offensive performances of the season. Normally, the Pirtes are led by former Longhorn Sterling Gibbs. The transfer is averaging 16.3 ppg, good for third best in the conference. He is a prolific three point shooter, his 47 treys follows only Kellen Dunham’s 48 and Matt Carlino’s 50. Gibbs is hardly just a sniper, he also the quickness to take a defender on the dribble and the awareness to set up a teammate for an open look. The Hall only features two other three point threats, Sina and Mobley, both of who shoot around 30%. Any Seton Hall misses are likely to be cleaned up by Angel Delgado. The freshman forward has a motor like a freight train and is an absolute vacuum when it comes to Seton Hall misses. His 70 offensive rebounds are good for number 1 in the conference. Marquette’s defense will focus on denying Gibbs any open looks and keeping Delgado off of the boards. Expect a lot of zone with a little more 1-3-1 than has been seen in the past. If Seton Hall does work their way into the paint, MU should feel free to hack away. The Pirates rank dead last in FT% in the conference. On offense, Marquette will face a lot of long, lean, quick defenders. Seton Hall started the year as one of the best teams in the BEast at forcing turnovers. Since Whitehead went down, they have slowly declined. In the last five games, Seton Hall has failed to force more than 10 turnovers in every game except one…and the Depaul offense was more to blame than the Seton Hall defense (3 steals). They may not look it, but Seton Hall does feature two legitimate rim protectors in Delgado and Mobley. Carlino has been on an unbelievable tear in the past few games. Since his 2-8 performance in the 1st Georgetown game, the graduate transfer has gone 19-33 (.576) from deep. Combined with the resurgence of Duane Wilson, Marquette should have enough firepower to take on the Pirate D.
Best Case: #Car3no continues his unreal four game performance with another six treys. Duane Wilson, officially risen from the dead, chips in with a few of his own. Juan doesn’t score much but puts on an unreal performance on the boards, grabbing 11 and keeping Delgado away from easy putbacks. Fischer, faced with an opponent much smaller than he is, responds with double digit scoring and three blocks. Gibbs attempts to keep the Pirates in the game but his tries from deep clank off the rim. Marquette snaps their three game losing streak, beating Seton Hall by 11. Worst Nightmare: Seton Hall remembers that if they can beat Villanova, they can definitely beat Marquette. Gibbs goes off from #car3no range and nails four treys. He misses a few but they find their way into the waiting arms of Angel Delgado. At least one of those ends up being a putback dunk that puts Derrick on a poster. After a long stretch of good Carlino, Marquette fans are reintroduced to bad Carlino. #carohno takes several ill advised threes resulting in too many empty trips. 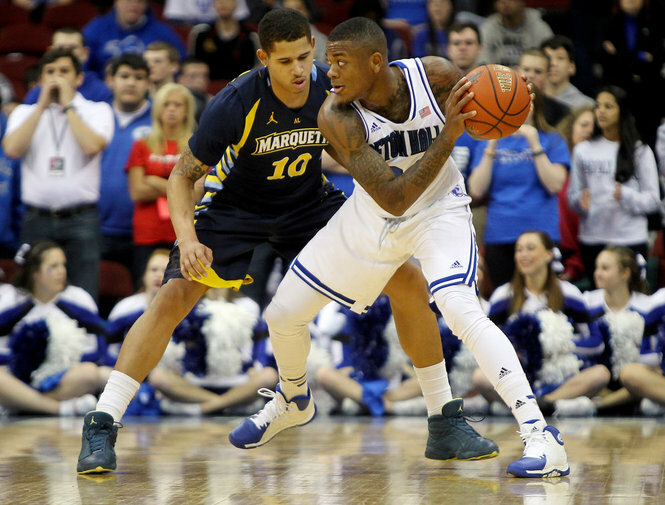 Seton Hall wins by 7, extending Marquette’s losing streak to four.